For roasting there are rolled sirloin and ribs, both have some natural fat around them. Topside, silverside and rump joints offer a leaner option for top quality roasting, while a cheaper alternative for a lean cut is leg of mutton cut of beef and for those who like some fat there is the cheaper top rib. Brisket is a cheap cut which when cooked slowly for a longer time is nice. If you like your beef on the bone then there are ribs with some fat in them, or tag end, which is leaner and good value. For casseroles and pies there is a choice of best lean slices of braising steak, or chuck steak, or the very popular ready trimmed and diced beef. For long stewing shin of beef is good value. 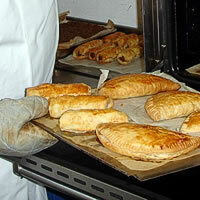 Skirt is lean and tender and especially good for making pasties. Ox tails and ox cheek are kept in the freezer. We can supply the usual steaks; rump, fillet, sirloin, ribÂ­eye or T-bone. Rump being the cheapest option with fillet the most expensive. 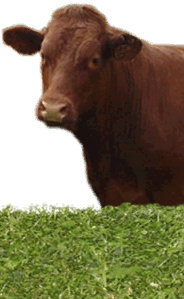 Beef prices are generally stable but steaks are subject to fluctuation caused by high seasonal demand in the summer. Our minced beef is a lean one, and cheaper than supermarket prices. We also make a pet mince which is very popular and very reasonably priced. It comes frozen in 1lb (456g) lots. For roasting there are rolled loin, leg and shoulder joints. Leg is the leanest, loin usually has some fat around it while rolled shoulder has some fat, is best cooked slowly and is excellent value. All of these cuts can also be roasted on the bone, in addition to blade and hand of pork, which are both cheap ways to feed a family. Belly pork can either be roasted in a piece or cut into slices and is good value. Pork chops can be cut from the rib, loin, chump or spare rib, the latter being the cheapest. 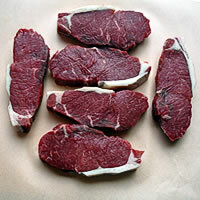 Loin and chump steaks are proving to be very popular lately and come with no rind or bone. Tenderloin of pork is suitable for quick cooking. We also prepare lean diced pork, minced and stir fry pork. In the freezer is an abundant stock of real old fashioned fat bacon. We cure our own bacon and hams at Parkham, providing a selection of back, middle and streaky bacon as well as gammon, oyster and collar joints and gammon steaks. 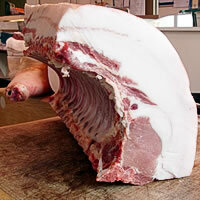 For smoked bacon we buy in top quality supplies from the Cornish Farmhouse Bacon Company at Whitstone. We also prepare salt tongues and beef as required. For cooking with, our bacon pieces and misshapes are good value. The best end neck can be prepared as a rack, a crown roast or noisettes. For chops there are loin, chump or best end neck. The breast of lamb is very cheap. 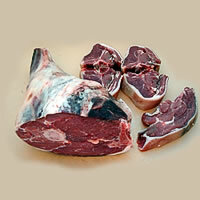 Stewing lamb is available on the bone cheaply or boneless and diced. We can also mince lamb and cut leg steaks. Lamb shanks and rumps are kept in the freezer. We have fresh chickens every week from Kelly’s of Copplestone, from 3½1b (approx 1.6kg) to 4½lb (approx 2kg). Free-range chicken and bigger barn-reared chickens with the giblets are bought from Creedy Carver at Crediton. We also have a full selection of cuts such as boneless breasts (with or without skin), leg or breast quarters, drumsticks, wings and thighs. Fresh ducks can be ordered for Thursdays and duck breasts and legs along with chicken livers are kept in the freezer. Turkeys can be obtained with a few days notice. We also keep turkey breasts, thighs and drumsticks. Our shop is licensed to sell game and we usually have venison (as joints, steaks, mince and diced), rabbits, partridge, pigeon, guinea fowl, pigeon breast and pheasants. 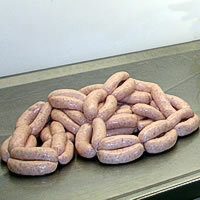 For people with such dietary requirements, we make a gluten free sausage in pork, venison and wild boar flavours. We always have freshly made beef, pork & apple and lamb & mint burgers, which are at least 3oz. We keep quarter pound and six ounce beef as well as 3 ounce turkey, sweet chilli chicken and gluten free burgers in the freezer. We cut, pack and label quarters of beef, half pigs and lambs to your requirements, delivered fresh or frozen. We carry a full range of liver, kidneys and hearts from pig, lamb and ox. We get calves and venison liver when available and always have frozen tubs of chicken liver and sweet breads. A selection of home cooked ham, tongue, pressed beef, roast beef and roast pork. We also make our own faggots, hogs pudding, haggis, brawn, beef dripping, lard and jelly stock. Also available are black pudding, tripe, pork scratchings, and the locally made Parkham Farms award winning mature cheddar cheese. We have daily deliveries of milk and local free range large eggs.